Though most rollerball eye serums are a bit too heavy or messy for daytime use, I’ve found myself rolling on Zweena’s Argan Ultra-Nourish Eye Serum both morning and evening — and loving the non-greasy, rosy results. 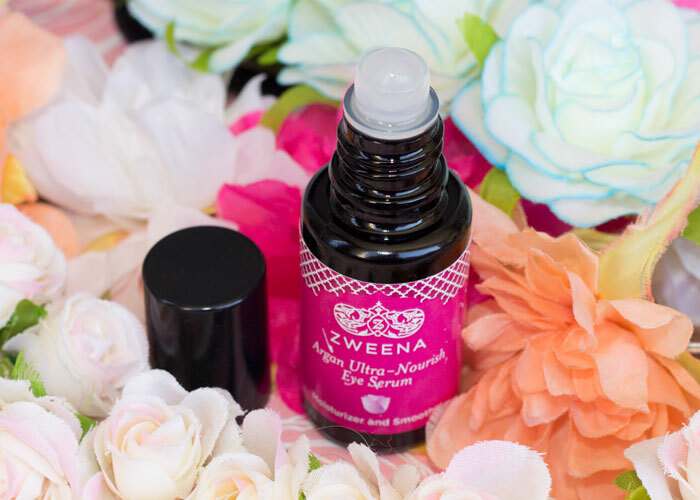 Zweena’s gorgeous all-natural eye serum absorbs quickly — I can pat it into my skin, brush my teeth for two minutes, and then get to my morning makeup application. I love how it nourishes my prone-to-flakiness undereye skin with its lightweight mixture of oils. My concealer glides on very easily after using this serum, yet doesn’t slip around or get creasy — my skin is perfectly prepped. Zweena Argan Ultra-Nourish Eye Serum packs ingredients rich in antioxidants, essential fatty acids and vitamins into a half-ounce rollerball-top jar (does anyone else just adore a cool rollerball of oil in the morning?). Argania Spinosa (Argan) oil *, Sclerocarya birrea (Marula) oil, Adansonia Digitata (Baobab) oil **, Camellia Sinensis (Camellia) oil **, Rosa Canina (Rosehip Seed) oil **, Citrullus Lanatus (Kalahari Melon Seed) Oil, Limnanthes Alba (Meadowfoam) oil, Moroccan Rose Damascena (Rose) Flower Oil. As you can see, Zweena founder Jayme Barrett included only the most luxurious, feather-light oils in her soon-to-be-cult-favorite eye serum. Jayme and her team personally source their organic argan oil from fair-trade women’s cooperatives in Morocco. The organic, cold-pressed argan oil is boosted with an omega-rich blend of African marula oil, organic baobab oil and Kalahari melon seed oil to protect the delicate eye area from signs of aging. Organic camellia and organic rosehip seed oil encourage collagen production in thinning eye skin while meadowfoam seed oil seals in moisture and leaves the skin with a satiny finish. After about a month of using Zweena Argan Ultra-Nourish Eye Serum, I’m totally sold on it. I’m eager to see how it performs during a harsh Midwest winter. This is now my go-to rollerball eye serum (and you better believe it’s coming on the plane with me for a little getaway this weekend!) not only because of the fact that it is truly perfect for both morning and evening, but also because the pricepoint (and pretty pink packaging). At $64 for a half-ounce, it beats out a few of my former favorites (see my previous eye cream and eye serum reviews), and as I continue to pare down my beauty collection, having a staple product that’s both multifunctional (morning and night), high-performance and affordable just makes good sense. Have you tried anything from Zweena? Do you prefer eye creams or eye serums? What has been your experience with using oil around your eyes? Tell me in the comments section!